To Cite: Makvandi K, Ranjbari N, Makvandi M, Ashraf Teimori A, Neisi N, et al. Study of the Association of Mutant HBsAg Gene and Hodgkin and Non-Hodgkin Lymphoma, Jundishapur J Microbiol. 2015 ; 8(11):e25726. doi: 10.5812/jjm.25726. Background: Hepatitis B Virus (HBV) is responsible for chronic, acute, and fulminant hepatitis, which are prevalent worldwide. Chronic HBV may lead to cirrhosis and hepatocellular carcinoma. Several epidemiological studies have indicated that hepatitis B virus is involved in B-cell Hodgkin and Non-Hodgkin Lymphoma (NHL). Objectives: The aim of this study was to evaluate the association between hepatitis B infection and Hodgkin and non-Hodgkin Lymphoma. Materials and Methods: Paraffin embedded of 41 block samples including 12 (29.26%) Hodgkin and 29 (70.73%) non-Hodgkin patients were collected. Next, DNA extraction was carried out for all the samples followed by HBV DNA detection by the nested polymerase chain reaction (PCR). The positive HBV DNA samples were sequenced, and HBV genotypes and HBV subtypes were determined. Results: Three out of 12 (25%) Hodgkin samples and seven out of 29 (24.13%) non-Hodgkin showed positive HBV DNA results. The results of sequencing revealed that the D genotype was predominant among the positive HBV patients. Interestingly an unpredictable amino acid proline was detected in position 88 of the HBs gene, which indicates a new mutation in the “S” region of HBV DNA in patients with Hodgkin and non-Hodgkin lymphoma. Conclusions: A high rate of 25% and 24.13% of HBV DNA was detected among patients with Hodgkin and non-Hodgkin lymphoma, respectively. The association of Hepatitis B Virus (HBV) and hematologic malignancies, including Hodgkin lymphoma and Non-Hodgkin lymphoma (NHL) has been previously studied (1). Hepatitis B Virus causes a wide range of liver diseases, including subclinical infection, acute, chronic and fulminant hepatitis. Chronic HBV may lead to cirrhosis or Hepatocellular Carcinoma (HCC) (2). Hepatitis B Virus is a DNA virus, which belongs to the Hepadnaviridae family (3). The genome of HBV is a partially double stranded circular DNA with molecular weight of 3.2 Kbp. The viral genome encodes four open reading frames (ORFs: S, C, P and X). The ORF S encodes HBsAg, which consists of pre-S1, pre-S2 and S regions. The ORF core/pre-core encodes HBcAg, and soluble HBeAg. The ORF X encodes the X protein (HBX) and is a transactivator that influences the transcription of HBV genes by regulating the activity of transcriptional promoters and ORF P, which encodes DNA polymerase and reverse transcriptase (4). The HBV is classified into eight genotypes, A to H (5). Genotypes A and D are prevalent in Europe, United States, and Africa, whereas genotypes B and C are prevalent in Asia. Genotype D is predominant in the Mediterranean, Middle East and India. Genotype E is the dominant genotype in West Africa whereas F and H have been isolated in the America (5). Based on amino acid substitutions in positions 122 and 160 of the S region of HBV DNA, four major subtypes: adw, adr, ayw and ayr, and nine minor subtypes have been described (6). Hepatitis B Virus is a hepatotropic virus but recently HBV DNA has been detected in Peripheral Blood Mononuclear Cell (PBMC) of patients with acute and chronic infection (7-9). Some studies have suggested that the HBV DNA could replicate in PBMC and proved this suggestion by detection of HBV mRNAs and expression of HBsAg and HBcAg in PBMCs (10-15). These observations show that the lymphoid system could be an important reservoir for Hepatitis B Virus (16). The HBV DNA integration in PBMCs has been demonstrated previously (7, 17-19). Hodgkin lymphoma and non-Hodgkin lymphoma are lymphoid malignant tumors, and are prevalent worldwide. Recent studies have revealed the association between HBV infection and Hodgkin and non-Hodgkin lymphoma (20-22). The aim of this study was to determine the prevalence of HBV DNA and S region mutations among block samples of patients with Hodgkin and non-Hodgkin lymphoma in Ahvaz city, Iran. Paraffin embedded tissues of 41 block samples including 12 (29/26%) Hodgkin and 29 (70.73%) non-Hodgkin patients were collected from Imam Khomeini hospital located in Ahvaz, Iran, during 2002 to 2011. The following steps were then carried out for the detection of HBV DNA in the patient samples. Statistical analysis was done with the Chi square test using the SPSS software, version 20. Initially all the samples were deparaffinized with xylene. The DNA extraction of all the tissue samples was carried out using the high pure PCR template kit (Roche, Germany), according to the manufacturer’s instructions. The nested PCR for detection of HBV DNA was performed for all the tissue samples. The primers for partial sequencing of the “S” region are presented in Table 1 (23). For the first round, 5 µL of the extracted DNA from each sample was added to a PCR reaction mixture containing 0.5 µL dNTP (10 Mm), 2.5 µL PCR buffer (10x), 0.15 µL 5U Taq DNA polymerase (Roch, Germany), 50 pmol/µL of the FHBS1 and RHBS1 primers, 0.5 µL dNTP (10 Mm) and 15.85 µL distilled water. The samples were Placed in the thermal cycler (Techne Company, UK) and the first round amplification was carried out with initial denaturation at 94°C for five minutes, followed by denaturation at 94°C for 30 seconds, annealing at 56°C for 30 seconds and extension at 72°C for 30 seconds, for a total of 30 cycles. For the second round, 5 µL of the PCR product was added to 25 µL of reaction mixture containing the same components mentioned in the first run including dNTP, PCR buffer and Taq DNA polymerase with 50 pmol/µL of each of FHBS2 and RHBS2 primers. Amplification was carried out in the thermal cycler with the same program as the first round. Next, 8 µL of the nested PCR product (417 bp) was analyzed by 2% agarose gel electrophoresis. 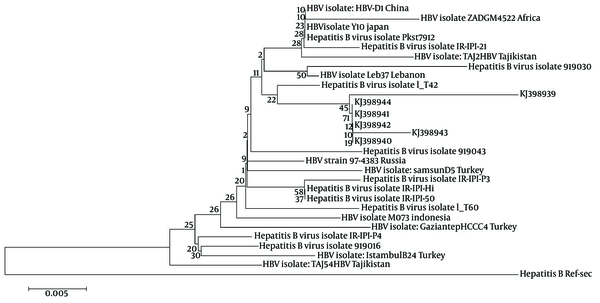 Amongst the ten samples positive for HBV DNA, six samples were sequenced (Applied BI Benier Company, South Korea). The sequences of all the six samples were submitted to NCBI and registered in GEN Bank (Table 2 and Figure 1). Hepatitis B Virus sequences were aligned with the HBV reference sequence from Gene Bank using the HBV data-base and online Blast. A phylogenetic tree was constructed using the Mega 5 software. To evaluate the HBs subtypes and S region mutations of the positive samples, (Figure 1) the amino acid substitutions in positions 122 and 160 of the S region of HBV DNA were compared with the HBV reference sequence. Interestingly, the presence of an unpredictable amino acid substitution (L88P) was observed, which indicated a new mutation in the “S” region of HBV DNA in patients with Hodgkin and non-Hodgkin lymphoma, (Figure 2). Reference sequences were retrieved from Gen Bank with their accession numbers and origin. Bootstrap values are indicated in the tree roots. The consensus amino acid sequence of the reference D genotype is shown on the top. The partial sequences of all the six HBs genes in position 88 compared with the consensus sequence amino acid indicated a proline substitution with leucine. So far this type of mutation has not been reported in any HBV D genotype. The dots show conserved amino acid and the amino acid code indicates differences with the consensus amino acid. Out of 12 Hodgkin samples, seven (58.33%) and five (41.66%) were males and females, respectively. The age of the patients with Hodgkin lymphoma was between 5 and 34 with a mean age of 20 ± 7 years. Of the 29 Non-Hodgkin samples, 17 (58.62%) and 12 (41.37%) were males and females, respectively, Table 3. Out of the 41 samples, three out of twelve (25%) Hodgkin samples and seven of twenty-nine (24.13%) non-Hodgkin were positive for HBV DNA, Table 4. All the positive HBV patients were within the normal range for Alanine aminotransferase (20 - 32 IU/DL) and Aspartate aminotransferase (18- 27 IU/DL). The youngest Hodgkin patient was a female with 17 years of age and the oldest was a male with 29 years of age. The youngest non-Hodgkin patient with HBV infection was a male with two years of age and the oldest patient was a female with 75 years of age. The sequences of six positive samples (two Hodgkin and four non-Hodgkin lymphoma) were registered in GenBank with the following accession numbers, KJ398939.1 to KJ398944.1. The results of the alignment showed that the D genotype was the predominant genotype among the patients with Hepatitis B infection. Mutation analysis indicated amino acid substitutions in positions 88, 122 and 160 of the “S” region of HBV DNA. All of the six sequences were recognized as the “awy” subtype because of substitution in positions 122 and 160. Several epidemiological studies have revealed the persistence of Hepatitis B Virus (HBV) infection amongst patients with Hodgkin (HL) and Non-Hodgkin Lymphoma (NHL). In our study, 25% of Hodgkin and 24.13% of non-Hodgkin patients had positive HBV DNA, which indicates the high rate of HBV infection among these patients. The youngest Hodgkin patient with HBV infection was a female with 17 years of age and the oldest was a male with 29 years of age. The youngest non-Hodgkin patient with HBV infection was a male with two years of age and the oldest was a female with 75 years of age. The frequency of HBV infection among the male and female patients was not significantly different (P > 0.05). In our study all the HBV patients had the awy subtype. Distribution of HBsAg subtype has been reported in different regions of the world. Fernández et al. in Spain reported the ad and ay HBs subtypes amongst 40 chronic HBV patients (24). De Souza et al. from Brazil reported HBsAg subtypes adw2, adw4, and ayw amongst patients with mental problems (25). In our study the protein sequence, of all the six “S” genes, showed mutation at position 88 (L88P). So far this type of mutation has not been reported in any HBV D genotype. In the study conducted by Okamoto et al. a point mutation was found in the S gene of hepatitis B virus for two blood donors carrying a surface antigen with subtype adyr or adwr (26). All of the HBV patients had normal SGPT and SGOT tests. The patient’s history revealed that they were not tested for HBV and hepatitis C virus and it is not clear whether these patients had chronic HBV or occult HBV infection. However, there are some reports about the association of occult HBV infection and non-Hodgkin lymphoma (27, 28). The presence of unpredictable amino acid proline at position 88 of HBs gene indicates a new mutation in the “S” region of HBV DNA in patients with Hodgkin and non-Hodgkin lymphoma. In our survey the D1 genotype was dominant in all the HBV patients, which is similar to the report of Marcucci et al. (29). In the present study the role of other viruses including hepatitis C virus in Hodgkin and non-Hodgkin lymphoma was not studied however this requires further investigations (30, 31). There have been reports about the reactivation of Hepatitis B and Hepatitis C virus (HCV) infections during NHL treatment; in these studies it was revealed that the patients who were under chemotherapy showed HBV and HCV reactivation, yet other patients who received lamivudine before chemotherapy didn’t show any reactivation for HBV or HCV infection (32-35). In conclusion, a high prevalence of HBV infection (25% and 24.13%, respectively) was found in patients with Hodgkin and non-Hodgkin lymphoma, indicating the importance of HBV and HCV screening by sensitive tests such as PCR before chemotherapy to prevent HBV or HCV reactivation in patients with HL and NHL. The authors would like to thank the department of medical virology, school of medicine, Ahvaz Jundishapur university of medical sciences for their molecular experimental work. Authors’ Contribution: Nastaran Ranjbari was responsible for the accuracy of the data and contributed to the design and performance of the study. Manoochehr Makvandi and Niloofar Neisi participated in the laboratory evaluation and performed the literature review. Manoochehr Makvandi drafted the manuscript and was the guarantor. All authors read and approved the final manuscript. Funding/Support: This study was part of a student thesis and was financially supported by the health research institute, infectious and tropical disease research center under grant number 92129 provided by the student medical research center of Ahvaz Jundishapur university of medical sciences, Ahvaz, Iran.